Any dirt trackers breaking wheel bearings? This is a picture without the hub on the spindle i have ran the same one for 4 years now just gotta do a little reaming on the top holes and drill to new bottom holes. Just go to the junk yard and take the whole thing off from the Caravan axle. Both sides. That way you have a spare. By researching this forum and using google images, I did this project myself. You can to. When you find your Caravan hub at the junk yard, look what year you are taking it from (Inside the driver's door), go to Autozone's website and find the repair diagrams for that year Caravan (you'll need to register yourself on there if you want to keep memory of your vehicle. Then go to brakes. That site helps a newbie rebuild those brakes better than anything. Just my 2 cents. Good luck. Yes the drum is bigger. I have not noticed any height difference or if the wheel sits out further. This project works. Just do what people are saying and it'll be fine. I can't do the stock hub I broke and rolled 6 times ouch!!!!! 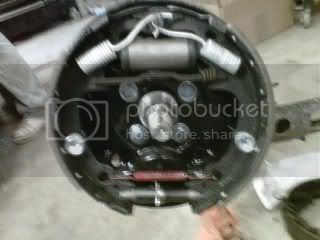 i'm making a mega change converting to 9" grand national hubs. with adapters to my stock 14" wheels. metric gm brake calipers. I will have drawings soon. About a month ago, I bought a machined hub that looks exactly like the Caravan hub from a fellow racer, who's Uncle has been making them. Stronger and beefier. 2 practices in on the season and it's tight and holding up. Machined is the way to go now. I am currently looking to do this type of swap, I'm not for sure i got the 15 or 14 inch spindle is there a difference between these? And are you teaming out the wholes on the spindle or on th rear axle? ust go to the junk yard and take the whole thing off from the Caravan axle. Both sides. That way you have a spare. By researching this forum and using google images, I did this project myself. You can to. When you find your Caravan hub at the junk yard, look what year you are taking it from (Inside the driver's door), go to Autozone's website and find the repair diagrams for that year Caravan (you'll need to register yourself on there if you want to keep memory of your vehicle. Then go to brakes. That site helps a newbie rebuild those brakes better than anythi.Just my 2 cents. Chuyen dat du an can giuoc vi tri dep so hong rieng, phan phoi dat nen can giuoc chiet khau cao.